My husband often regales me with tales of his youth, especially college; suffice it to say that his experiences were more adventuresome than mine. His first two years at university, for instance, were spent in Switzerland, and many weekends he and his international band of classmates descended their particular alpine slope and hopped the next train to Venice, stopping in Geneva and Milan before disembarking outside that romantic city of canals and hidden gardens and walking from the Santa Lucia train station across the Ponte degli Scalzi and into La Serenissima. 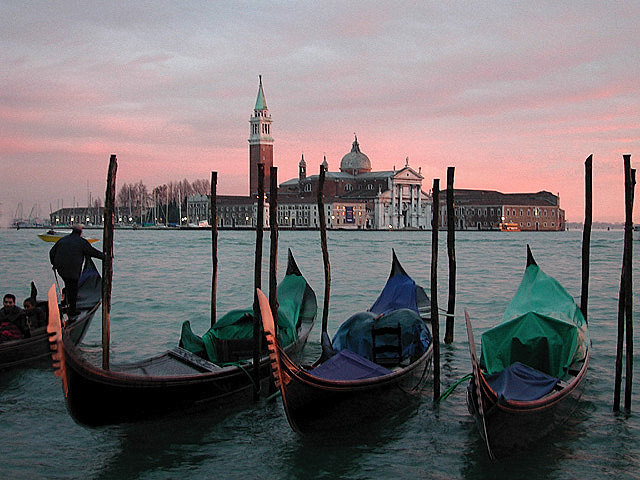 As photographs attest, Venice was where my spouse ruined his first white linen suit by falling into a canal (I thought that sort of thing only happened in the movies, namely to Katharine Hepburn), and where he developed a taste for the city’s famously rich cuisine. 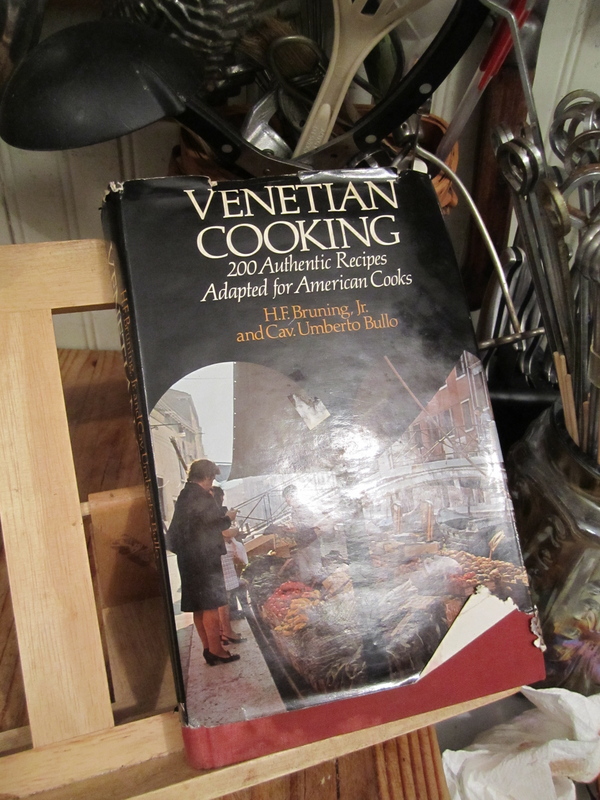 H. F. Bruning Jr. and Cavaliere Umberto Bullo's "Venetian Cooking" (Macmillan, 1973), a recent find at a secondhand bookshop. A serving of Verze Sofegae co le Costesine de Porseo on its way to the table. First of all let me assure you that the Verze Sofegae I made is more that just cabbage. 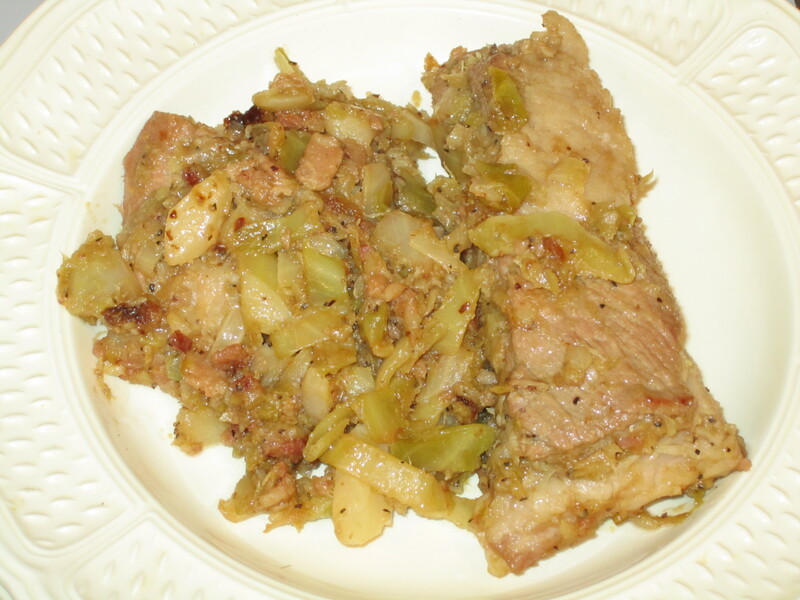 It is finely sliced cabbage leaves cooked for about an hour with minced bacon and meaty spareribs; this main-course version bears the lengthy name of Verze Sofegae co le Costesine de Porseo. Last night’s preparation was also the first time I handed our nine-year-old daughter a sharp knife and sent up a silent prayer. 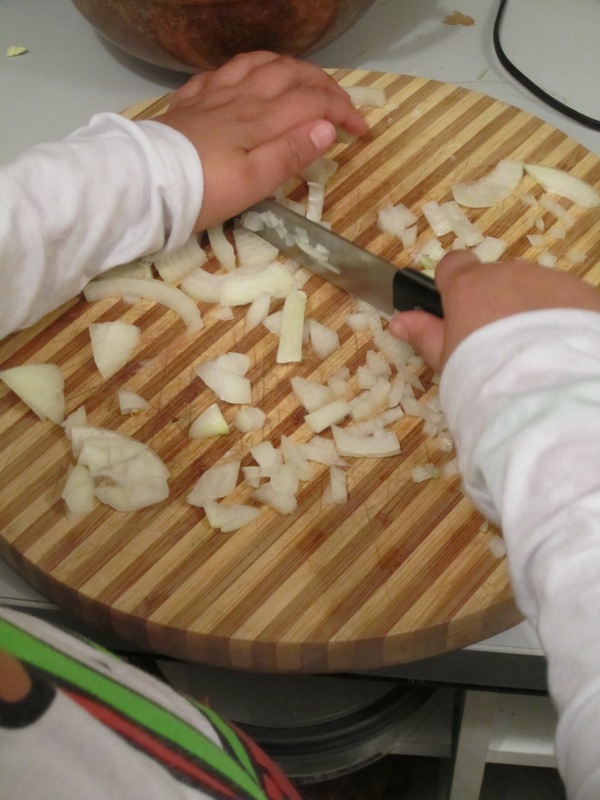 She insisted on helping so I handed over the onions for chopping and then the cabbage leaves, one by one, carefully slicing them into strips measuring about one-quarter-inch wide. Our daughter, carefully chopping onions for the recipe. “Don’t be such a scaredy-cat, Papa,” she said after I advised her, once again, to be careful not to cut her fingers. She was indeed observant and very meticulous, though she stated that she had no plans to make a career as a chef. As for the succulent dish we made together, she pronounced it good — truly it was enormously tasty — though the spareribs weren’t cooked to her liking. She prefers them quite brown, even a bit caramelized, so perhaps we’ll adjust Bruning and Bullo’s recipe to reflect that preference in future. 1. Remove and discard the first few outer cabbage leaves. Continue removing the leaves and place them in a sink full of cold water. [NOTE: I MERELY RINSED THEM IN A COLANDER.] Wash well and shake off as much water as possible and then cut the cabbage into strips about 1/4-inch wide. Cut ACROSS the stem, not parallel to it. 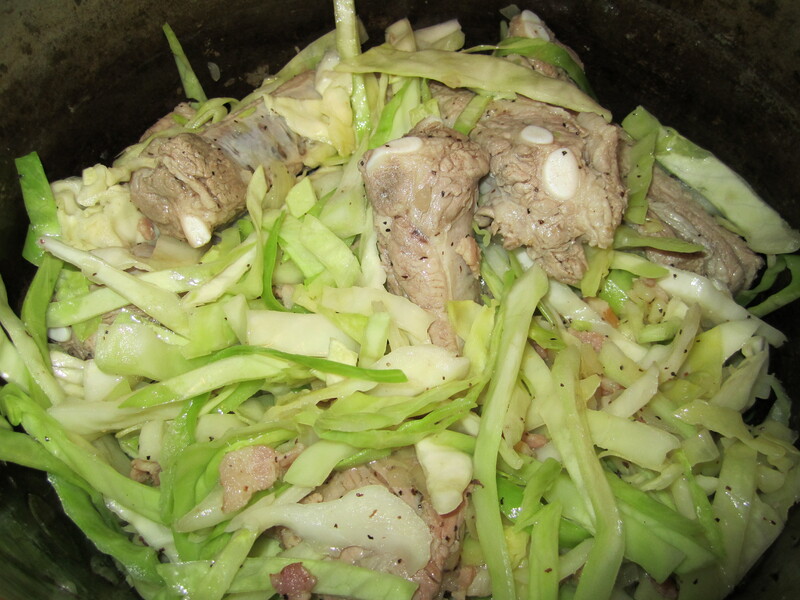 Cabbage added to the spareribs and bacon and ready to wilt and caramelize over a medium flame. 3. Serve immediately or place in a casserole or other ovenware and reheat later in a 300-degree Fahrenheit oven. Polenta is popular [as a side] with this dish. Which is a quiet way of saying we’ll be online again soon. Hope you’ll be there!